Seventy five percent of all ankle injuries are ankle ligament injuries, with 85% of those ankle sprains caused by inversion trauma, commonly referred to as “rolling” or “turning” the ankle. A sprain of a ligament is defined as an injury that stretches the fibers of the ligament. Sprains can be result from something as simple as running on uneven surfaces, or even by stepping off a curb. Rest: â€¨The first 24-48 hours after the injury is considered the critical treatment period, so physical activities need to be curtailed. Gradually put as much weight on the involved ankle as tolerated until you can walk with a normal gait (with minimal to no pain or limp). Ice:â€¨ For the first 48 hours post-injury, apply an ice pack and elevate the ankle 20 minutes at a time every 3-4 hours. The ice pack can be a bag of frozen vegetables (such as peas or corn), allowing you to be able to re-use the bag. Another practical treatment method is to fill paper cups with water and put in the freezer, then use the frozen cube like an ice cream cone, peeling away paper as the ice melts. Do not ice an ankle sprain for more than 20 minutes at a time, as this will not accelerate healing time and may also cause damage to the tissues. Compression: â€¨Use compression when elevating the ankle sprain in the early stages of treatment. Using an Ace bandage, wrap the ankle from the base of the toes all the way up to the top of the calf muscle, overlapping the elastic wrap by one-half of the width of the wrap. The wrap should be snug, but not cutting off circulation to the foot and ankle. If the foot becomes cold, blue, or falls asleep, this is a sign to re-wrap and loosen the bandage. Elevate: Keep the ankle sprain higher than the level of the heart as often as possible. Elevate at night by placing books under the foot of the mattresses or place pillows under the lower legs. Be sure to stand up slowly in the morning. Remember, more severe ankle sprain injuries, including complete tears of the ligaments and fractures of the bone, may require different treatment regimens and rehabilitation goals than a simple ankle sprain. It is important to see a Podiatric Physician before beginning treatment or if your symptoms do not steadily improve over time. If I sprain my ankle, how do I know if it requires medical attention? The ankle is one of the most commonly injured joints of the body due to the forces it withstands and the weight it supports. In the United States, approximately one sprain occurs per 10,000 people each day, which equates to about 27,000 ankle injuries every day! Pain that is severe and uncontrolled, despite of over-the-counter medications (i.e. Ibuprofen or Tylenol), elevation, and ice. The patient is unable to walk at least 4 steps or cannot walk without severe pain. The ankle shows no signs of improvement within five to seven days. 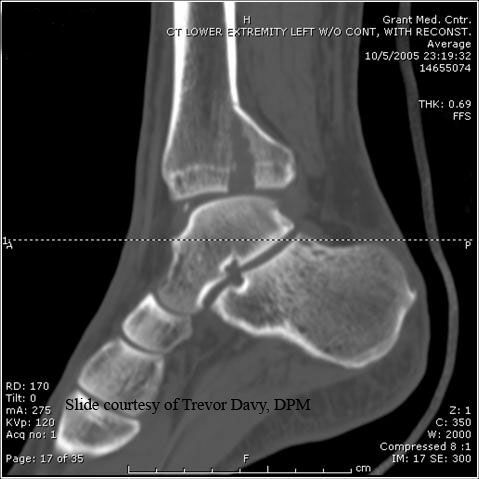 The foot or ankle looks misshapen beyond normal swelling. The patient experiences a loss of feeling in the foot or toes. Severe pain caused by pressing over the medial or lateral malleolus (the bumps on each side of the ankle). Pain and swelling that is present in the back of the ankle, over the Achilles tendon area, or inability to push the toes down (forward-like pressing a gas pedal). Pain or swelling that is present to the upper part of the lower leg just below the knee or swelling of the calf muscle. With a normal ankle sprain, a follow-up visit one to two weeks after the injury is advisable to help with flexibility and strengthening exercises. For more information or to consult with one of the foot specialists in our Berkley Office, please contact us at (248) 545-0100. We have been serving the Berkley, Southfield, Royal Oak, Oak Park and Ferndale areas for over 30 years!